A major portion of our work relates to flood defence in some form - be it tidal defence or fluvial control. We’ve designed all types of gates for this purpose including vertical lift sluice gates, mitre gates, sector gates, bottom hinged fishbelly gates and radial gates. And, as the UK’s leading specialists, we’ve also helped clients operating the majority of the UK’s large storm barrier / barrage schemes. The key challenge is selecting the right design of gate for each application. Even in replacement projects this doesn’t always mean replacing the exact same design as in, for example, cases where access for the appropriate lifting gear is no longer available or where an alternative approach might better overcome the very reason the existing gates need to be replaced. 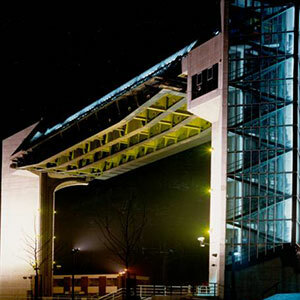 Our analysis will take into account all the factors which have the potential to influence the gates’ performance, durability, reliability and cost: everything from the ease of erection through the ongoing ease of maintenance to refurbishment and final dismantling. The reliability of gates in these applications is paramount. Unlike the operation of lock gates for example, where a malfunction would be inconvenient rather than catastrophic, when flood defence gates need to close there can be no room for failure. As part of the team currently engaged in the decade-long first phase of the UK Environment Agency’s River Thames estuary tidal defence programme (TEAM 2100: Thames Estuary Asset Management) we are recognised as the gate experts in terms of hydraulic, mechanical, electrical and structural engineering. 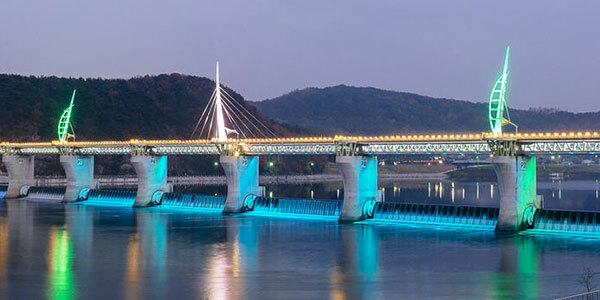 Images: (l) the control gates on the Han River at Yeoju, Korea for which we designed all seven rising sector gates, and (r) the vertical lift "turnover" wheel gate tidal surge barrier at Hull on the north east coast of England. We have undertaken a number of Hull barrier tasks, most recently project managing the gate upgrade on behlaf of the Environment Agency. KGAL engineers were involved in the origianl design, manufacture and installation of the gate when it was built in 1980.